Your can get first choice on my new creations for the holiday season. Give original artistic gifts this holiday season that match every personality! 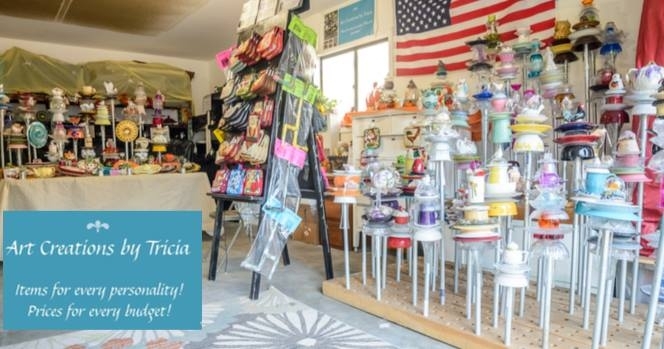 Shop Local for Great Gifts for Everyone On your Gift List! With gift prices as low as $4.00, we have the perfect gift for every personality on your gift giving list and prices for every budget. Recycled Glass Yard Art Bird Feeders and Flower Plates priced as low as $15, $6 Decorative Succulents, $6 Magnetic Note Pads, $7 Marshmallow Shooters, $4 "I Spy" Activity Bags, $1 candy wands and over 1000 magnets for $1 each or Magnet Gift bags with four magnets and a note in a bag for $4, $2 Idaho Bean Spoon, and $200 Wooden Moose and more! Each recycled yard art bird feeder and flower plate is original like nothing you can buy in a store. Each yard art comes with a metal post to put in the ground and the vase slides right on top of the post. They can be left outside all year long! Call for an appointment. Shop year round in my shop to purchase gift or a special something just for yourself. Simply contact me for an appointment at 208-863-7975. Or view current photos of artwork available at www.facebook.com/artcreationsbytricia. Bring the Kids for Fun Activities While You Shop! Dig for Treasure in the Treasure Garden! Make a Pine Cone Bird Feeder. Blow bubbles and play with chalk and games! Free Marshmallows & Fun! t can be a fun stop for the whole family! Sat. Sept. 29th- 9a-8p & Sun. Sept. 30th 9a-4p. 1080 W. Chateau Ave. Meridian, 83646.